So a while ago I interviewed The Acid Wizards on their unique choice of genre. 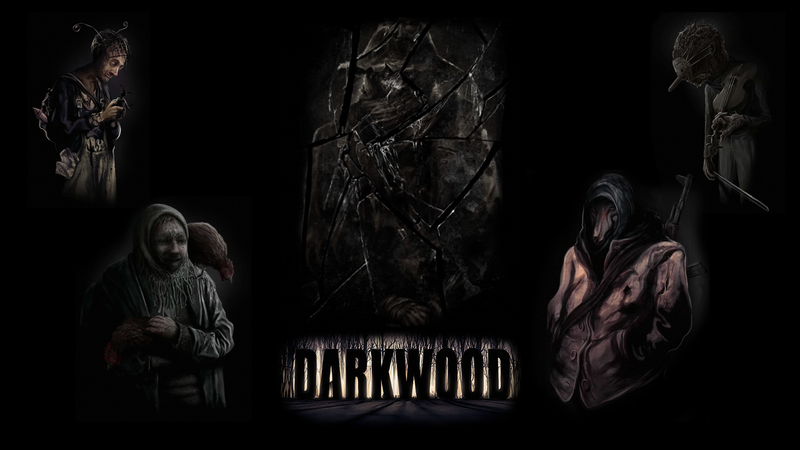 Darkwood is a top down horror game based around an individual trying to survive and eventually escape some crazy forest. The characters are terrifying but so intriguing. The game begins with the player character waking in a random house, in a randomly generated world. You are greeted by The Wolfman, which is literally that. A humanoid wolf, standing and talking to you. Meat he calls you, making a joke about your luck today because he wasn’t hungry. He gives you a bucket, to drink from the well outside your house at night claiming you’ll understand why. Turns out it’s basically magic and without that water, you’ll die during the night. But you can’t just sleep; the dark is when things get even more dangerous. You’ll have to prepare; board up your doors and windows. Put traps in place and wait out the night as the darkness comes for you. You spend the days exploring the forest, scavenging for supplies. Mainly you look for these mushrooms that you can use to essentially ‘level up’. They give you a new attributes like a wider cone of view but are more prone to attack from animals. The entire game is a double-edged sword. You can scavenge later, but the map offers no clue as to your position. If you don’t pay attention or panic, you won’t be able to get home in time and risk even more. You can decide to stay in and hide, but you won’t get any supplies and you won’t progress. You can horde, but you can only get so many supplies that way. You must trade with the Wolfman and explore to find other people like him. But all the people are… unusual. It’s hard to explain but they’re just wrong. The game is full of these moments and feelings. There is this constant air of unease and just a lurking sense of danger. All animals are aggressive and violent, the mushrooms you look for can poison you if you step on them, there are traps left over from unknown parties, and other dangers. You see, while the gameplay and the story are quite outstanding, it is the atmosphere that make this game. While you explore and walk, your vision is limited to a specific cone of vision. This means you can’t see what’s behind you unless you look. You have a peripheral vision in this cone, but only barely. There is no music for the most part of the game. It is always silent which, and trust me on this, is terrifying. Walking through the forest, you will hear the wind rustle through trees and twigs will snap. Darkwood is a game that boasts an incredible atmosphere. It drove me to paranoia and I find it quite difficult to play sometimes. Every time you ‘level up’ the character will fall into a sleep and enter a dream state. These dream sequences are, somehow, even stranger and scarier than the regular world. This game messes with your head, from the second you press play. And I feel like it’s something that the indie scene has finally brought back into the horror genre. Plenty of big titles like The Evil Within tried this atmospheric feel, but they all discard it in exchange for big explosions and lots of gun fights. The very start of The Evil Within is the closest it comes to this atmosphere; weaponless and wounded, sneaking around a terrifying butcher enemy. But it drops the pretence and swiftly hands you a revolver. Pew-pew. My main thought for this was the idea of atmospheric horror. Something that is easily the most effective form of horror. Because there are only hints to the terror and the player’s mind does the rest; which often results in him or her freaking themselves out. This is much harder to pull off but so much better than; Boo! Blood! BANG!. Dead Space is another sad example; you can literally see the change across the three titles. The initial game was utterly terrifying and while you did have a weapon, it was the eerie atmosphere that put it in the spotlight. Skip to number three and I was able to play through it with a friend(which already took the scare factor out) and laugh while doing so. To finish this ramble; Darkwood is a refreshing taste of horror. It never overwhelms you too early and it doesn’t baby you. There is no learning curve; only you, the forest, and some psychedelic mushrooms.